platforms. Download | Order Now! Advanced Audio Coding, or AAC, is a MPEG (Motion Pictures Experts Group) audio standard first adopted as part of the MPEG-2 family of standards. AAC is a Lossy Compression format capable of delivering relatively high quality at relatively low bitrates. TuneClone AAC to MP3 Converter is a DRM remover for converting iTunes protected AAC to MP3 for playback on non-Apple MP3/MP4 players and mobile phone players including Zune, PSP, PS3, BlackBerry, Creative Zen, iriver, Walkman, Pocket PC, Xbox, Nokia, LG, Motorola, Sony Ericsson, Google Phone, etc. You can download the latest version of AAC to MP3 Converter and begin to convert AAC to MP3, convert M4A to MP3 and convert iTunes music to MP3 format. Take note that AAC to MP3 Converter runs on Windows XP, Windows Vista 32/64 bit, Windows 7 32/64 bit. Q: Why Use AAC to MP3 converter? A: When you purchase music from iTunes Store, they are actually DRM protected content (protected AAC or say M4P) and you will not be able to play the protected AAC (M4P) files on MP3 players which do not support their formats. 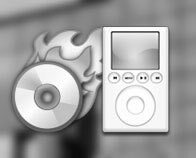 In such case, the option is to Burn those tracks to a CD and then Rip them once again to the computer hard drive wherein the DRM will be removed and you will get the tracks in (DRM free) MP3 format. After this you will be able to transfer them to a memory card or to most MP3 players. In case you have purchased a great amount of music from iTunes Store, you can go ahead and use AAC to MP3 Converter which acts as a Virtual CD-ROM drive on your PC, and lets you remove the DRM element without having to waste actual CD's. 2. Add the AAC songs to the playlist. 3. Launch AAC to MP3 Converter. Click the "Settings" tab. In the pop-up window, you can specify output folder, output file name format, output format (choose MP3), etc for the output files. Note: You can check whether TuneClone virtual CD drive is successfully installed and where it is installed in the bottom left corner of the interface. 4. Switch to iTunes. In iTunes, click the "Burn Disc" button. 5. 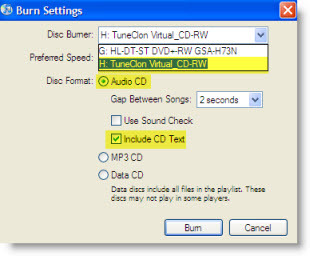 In the pop-up window of "Burn Settings", select "TuneClon Virtual_CD-RW" from the "CD Burner" drop-down list, click the radio button next to "Audio CD" and tick "Include CD Text" option. Click "Burn" to start burning. 6. Upon the completion of burning the disc and encoding the music, you can open the TuneClone manager screen to show all the converted music files. To locate the output folder, simply click the "Folder" tab on the interface. For more TuneClone tutorials, please go to http://www.tuneclone.com/guide.php. 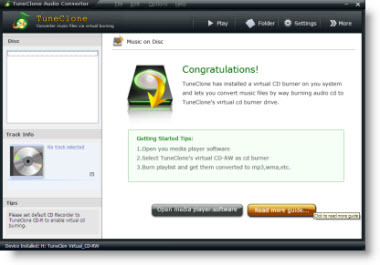 TuneClone Audio Converter for Windows V2.20 was released on Feb 24, 2012! TuneClone Audio Converter for Mac V2.3.0 was released on Jan 15, 2011! TuneClone V2.12 was released on Oct 19, 2011! Many bugs about ID3 tags were fixed in new version.